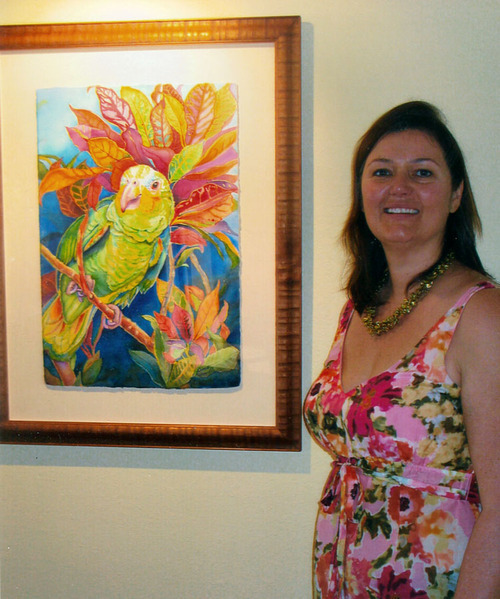 A new gallery opened in Holualoa, Glyph Art Gallery, owned by Ron and Lisa Haake! Ron has been my web designer and giclee maker for years. It’s beautiful. Right across from Holualoa Inn. Come and visit! The official Grand Opening at Glyph Art Gallery is taking place during the Holualoa First Friday Art Stroll from 6 to 9 pm on Friday, February 5th. 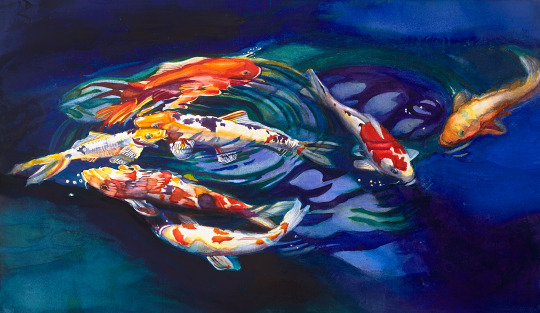 Many of my works are represented including this gem, Circle of Life, a larger scale koi painting, The title comes from the Lion King, a song about love and faith. The deep blue values resulted in pouring pigment over light colors and gave it an elegant quality. 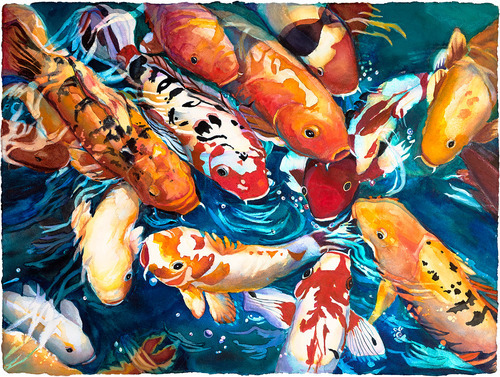 There is almost a human tenderness with the koi on the left! 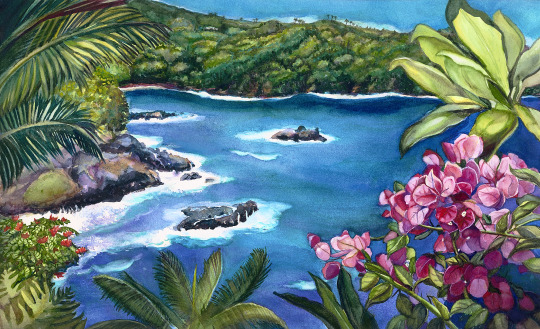 For the fun of it, I entered the Circle of Life, Memories of Onomea Bay, and Regal Hawaiian to the Splash 18 watercolor competition this year. Regal Hawaiian was begun in a Jean Pederson workshop. The portrait artist Kathy Long gave the final critique. It is a hula dancer posing solemnly before the performance. 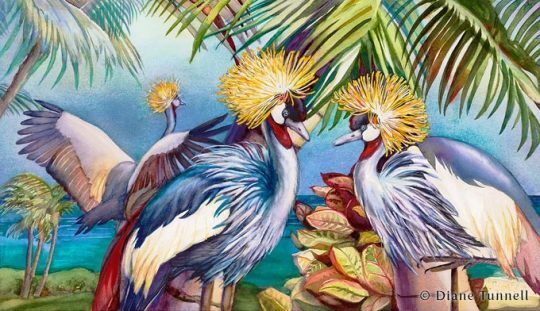 My painting “Waikoloa Conversation”, a painting of African gray cranes has been selected for the 2015 Hawaii Watercolor Society Members’ Exhibition. If you can make it to the show, please enjoy! I took the juror Jean Pederson’s HWS art workshop prior to the show, because I am very interested in portrait work and figures. She has written the book “Expressive Portraits”, I read before attending and each day she gave more and more insights on watercolor portraits and also mixed media. What a wonderful person, and she gives extensive information and demonstrations on wet glazing, elements and principles of design and much more. 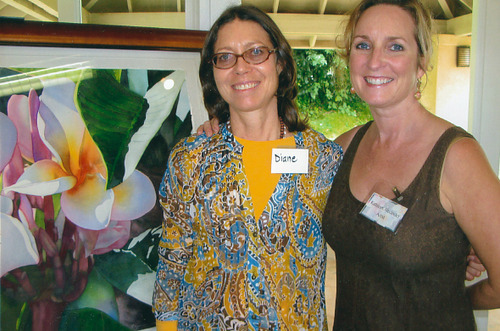 The first demo was at the beautiful Ho'omaluhia Botanical Garden. I toured the North Shore and Turtle Bay with some friends I stayed with in Kaaawa, Lorrie Tunnell and her husband John Thompson. The first workshop day was at the lovely Kaneohe Yacht Club and then the Unitarian Church on the Pali for the next four days. So now that I’m back home I’m working on a series of portraits, including Hawaiian dancers, loving the new glazing techniques and getting work ready for the next HWS show June 12th deadline and for the galleries. I’d like to share my three newest paintings with you. 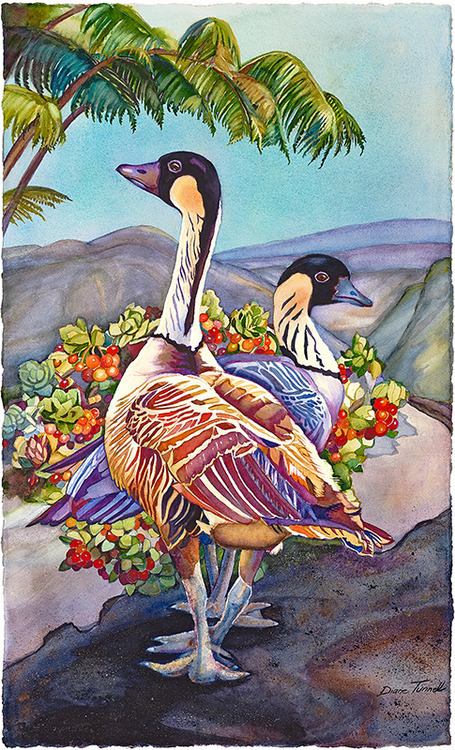 All three were just submitted to the 2015 Hawaii Watercolor Society Member’s Show, with juror Jean Pederson. I’m honored to have had work selected for this member-only, juried show for the last four years. 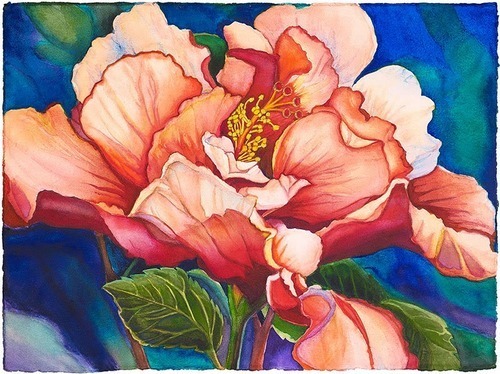 The show will be April 5-25 at Ho'omaluhia Main Gallery 9 to 4pm. It is located at 45-680 Luluku Road in Kaneohe on Oahu. This is a 400-acre park, with beautiful gardens and botanicals. The African Crowned Cranes are at the Hilton Waikoloa Village, a resort on the Kohala coast of the Big Island. I knew when I photographed them they would make a colorful painting! This is my beloved dog Moksha, in a playful moment turning to look at me. He is part Maltese and part Havanese and looks quite cute here! This normally high energy child is in one of his more tranquil and peaceful moments sleeping. 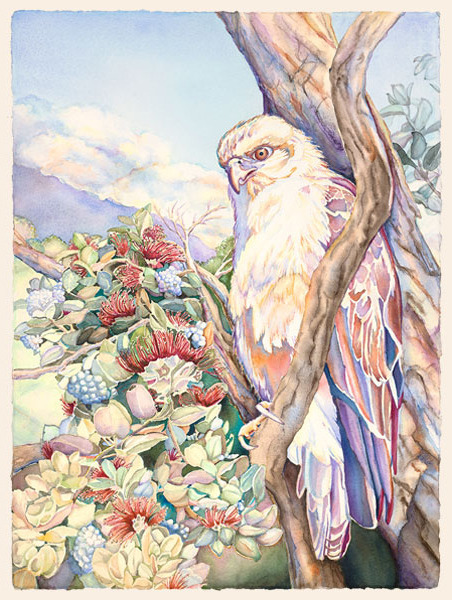 In the spring Hawaii Watercolor Society Members’ Show 2014, the juror, Jan Ledbetter selected my painting “Guardian” for the show. It is a short-eared, endemic owl found in Hawaii. The pueo is known as an ‘aumakua (ancestor spirit) in Hawaiian culture. I know people who consider the sacred pueo to be their 'aumakua, and it protects them. The pueo live in forests and grasslands. A family who are friends of mine, was fortunate enough to have a pueo fly with them for about a quarter of a mile while they were driving in their car! This painting of the Hawaiian owl, sold in Honolulu at the HWS show. It depicts the Hualalai Volcano in the background and the vibrant red lehua blossoms of the 'ohi'a tree which are also found in our area. In the spring of this year I plan on painting another version of the pueo, to compliment the i'o painting I have done. It is already drawn and is ready to paint for a possible commission. I am also working on four paintings for this year’s HWS spring show! Happy New Year to all of you! I’m starting the new year by highlighting more of the events of 2014 in the next group of blogs. 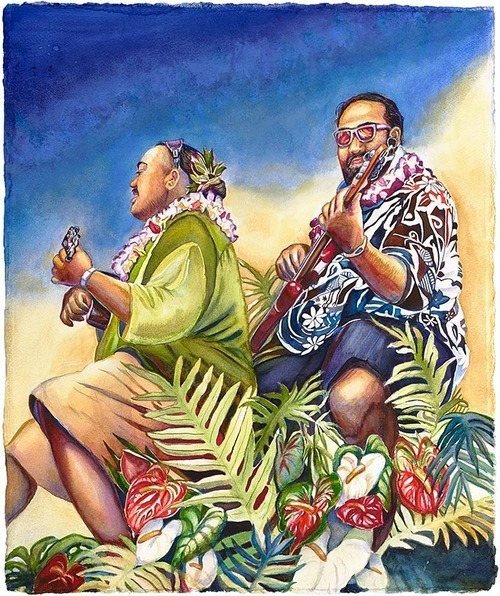 Two pieces of artwork were selected for last year’s fall Hawaii Watercolor Society Open Show. 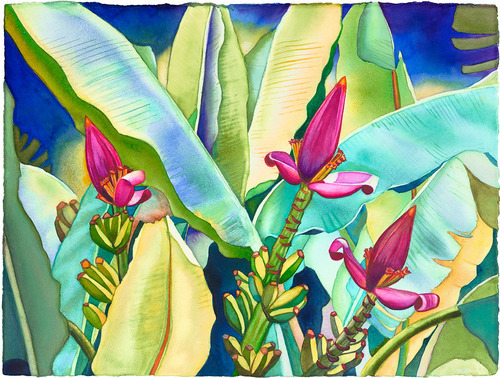 The juror Iain Stewart selected “Tropical Sanctuary” and “Upbeat Aloha.” I attended Iain’s watercolor workshop, and as a result my two most recent paintings have more quality of light in the work. Iain looked at my portfolio and said that I was a very fine artist, and not to change my style! 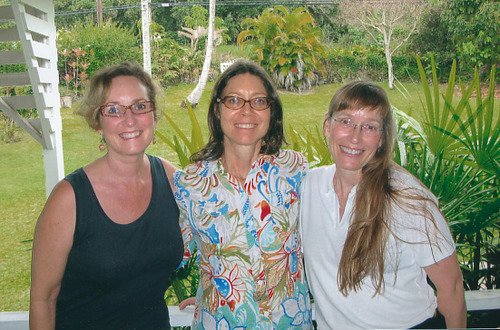 Thank you to all the gracious HWS members I saw in Honolulu, and to my friend Rebecca Snow, the workshop chair person. While there I saw the show, did plein air painting at Kailua Beach, and visited my friend Lorrie Tunnell and her husband John in Kaaawa with its breathtaking scenic views. 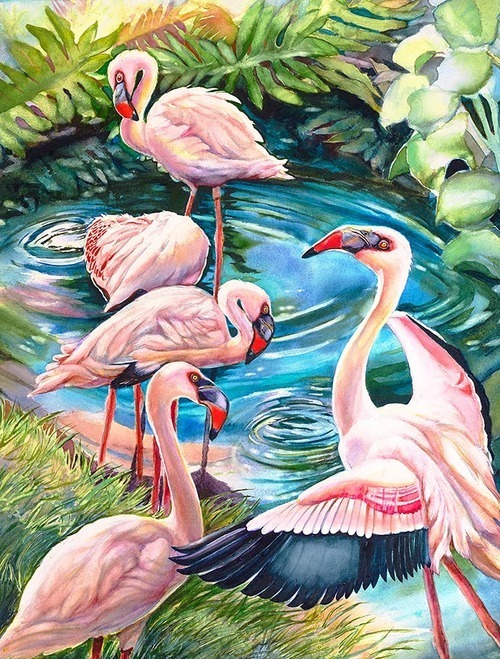 The Flamingos were in the Three Ring Ranch Exotic Animal Sanctuary in Kailua Kona on the Big Island. The musicians were in the King Kamehameha Day Parade in Kona. They are inspired by Devin Kahale Ali'i Keana'aina and his brother Gavin. Also please send comments if you enjoy my new updated web site! I have a new website, and along with the new website comes a new blog. 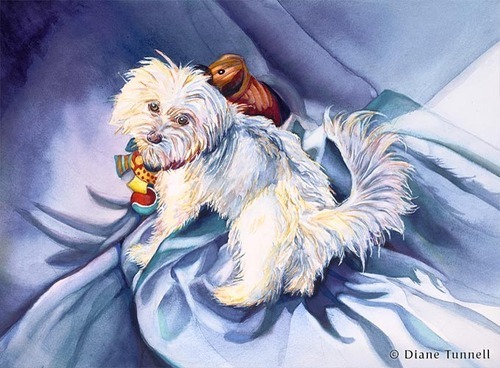 The direct link to the original blog is dianetunnell.tumblr.com, but all of the content is also imported into my website at dianetunnell.com, so it can be accessed either place. Look for more from me soon. 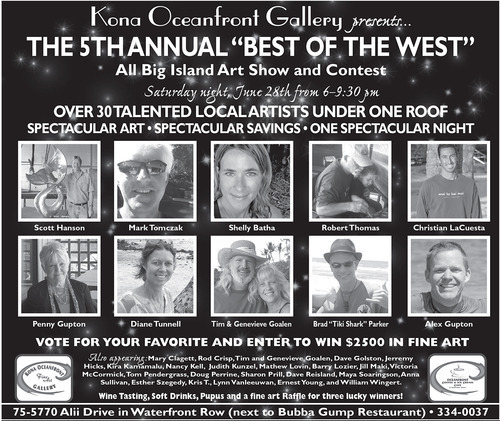 I will be one of the featured artists at the new show at Kona Oceanfront Gallery (formerly Wyland Kona Oceanfront Gallery). The reception is Saturday evening, June 28th from 6 to 9:30. Please stop by! 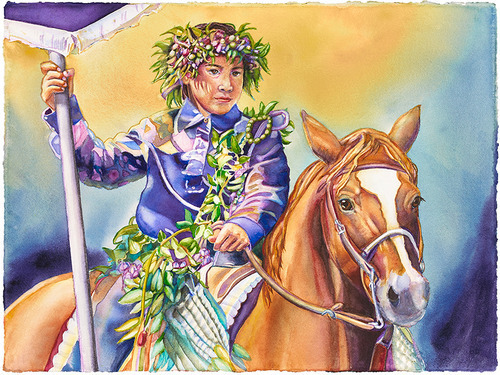 This painting of the Pau Rider and horse in the King Kamehameha Day Parade on Ali’i Drive in Kona, Hawaii won the SMS Research & Marketing, the Sun Eden Gear and the Armadillo Art and Craft Award with the Hawaii Watercolor Society, fall 2013. I am happy for the acknowledgement and it is one of my favorite paintings now. I’m so pleased with the faces of the boy and the horse and their eyes. The background colors had oozed due to my mistake with the film frisket and masking fluid but I stayed calm, the painting was saved and turned out beautifully! Oh, the joys of watercolor! 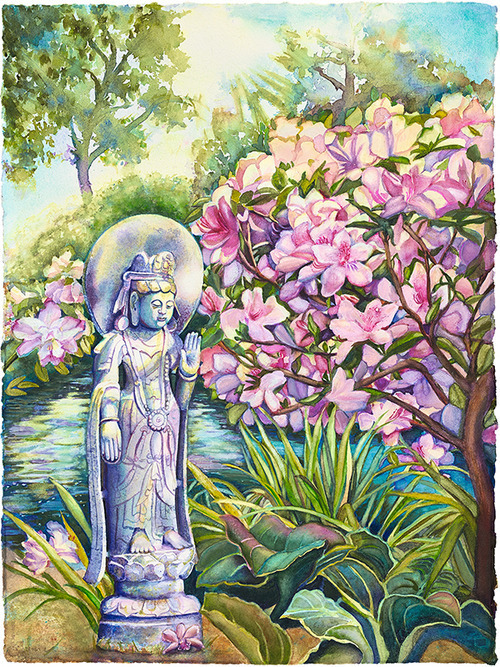 This lovely and graceful Quan Yin is giving the blessing and boon for inner peace that we all need. I like how the light fills the background landscape, the azalea bush and the flowing water. It was also in the HWS Open Show this fall. 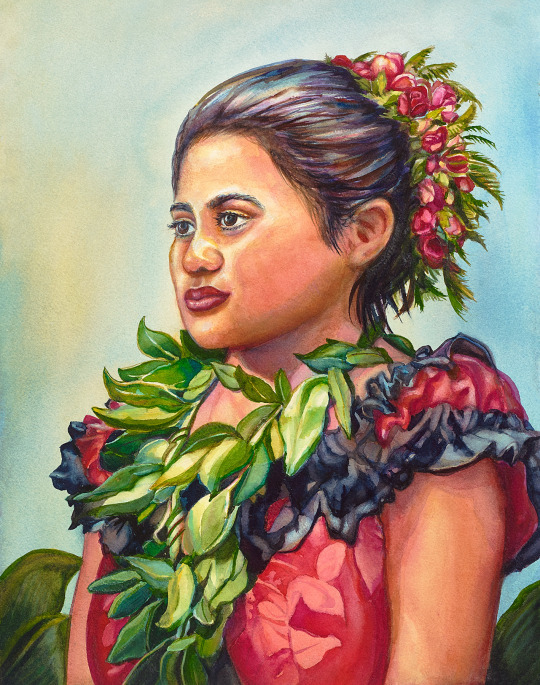 This painting was in the Helen M. Cassidy Juried Art Show sponsored by the Waimea Arts Council. I took a photo of a perfect scene in Kailua, on Oahu, when I went there to study with the artist Robert O’Brien. Many people are amazed at how realistic the men’s bodies are near their canoes, including the juror, Amaury Saint-Gilles. 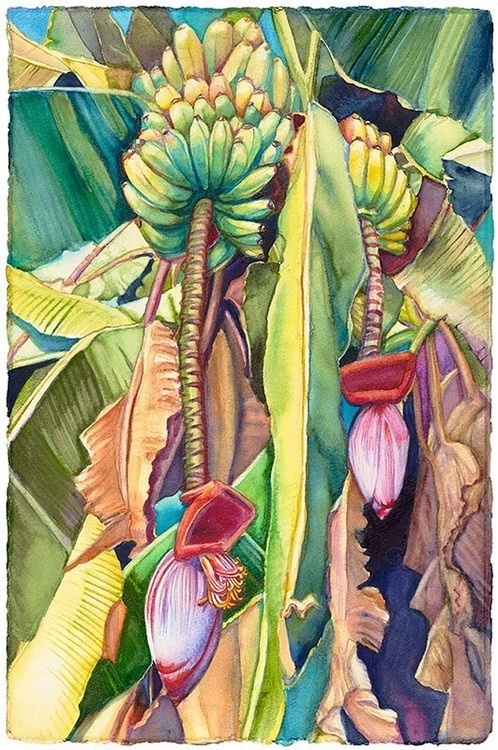 This was accepted into the Hawai’i Nei juried art exhibition in Hilo at the Wailoa Center, to benefit and educate the public about the native flora and fauna in Hawaii. It is a painting of nene. They are walking in the Hawaii Volcanoes National Park, and I used very contemporary stylized colors. I actually saw these nene in Maui, but changed the background from a tire of a car in the photograph to the Kilauea Iki Caldera instead as more fitting! Here are my new original watercolor paintings for you to view over the next couple of days on my blog. I would love feedback about the paintings, as well as my blog and website. 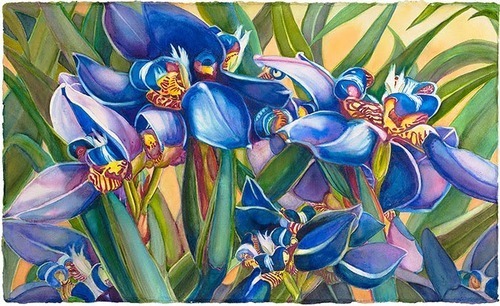 Magnificent Iris received the SMS Research & Marketing, Sun Eden Award with the Hawaii Watercolor Society Members’ Show, spring 2013. I flew to Honolulu for the reception to receive my first award. There are these tiny irises that bloom periodically in my garden, so they are quite magnified in the painting in these striking, dramatic blues. 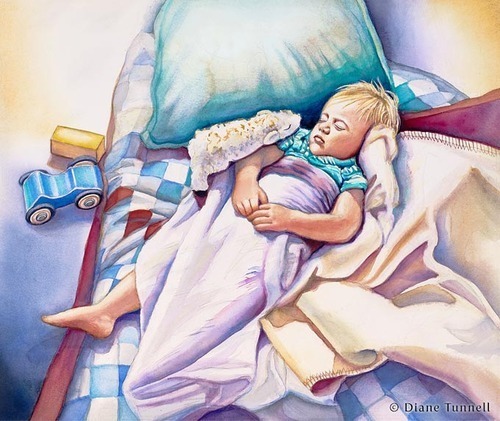 This painting was in the watercolor advertising section of the Southwest Art magazine, July 2013. Also in the same show as the above piece and I was told the juror was considering an award for it. It’s been a very popular piece. You can see banana trees all around Holualoa and the island. In fact there are a number of them in my back yard! The painting, deckled and floated with a lovely koa veneer frame is in Harbor Gallery in Kawaihae. 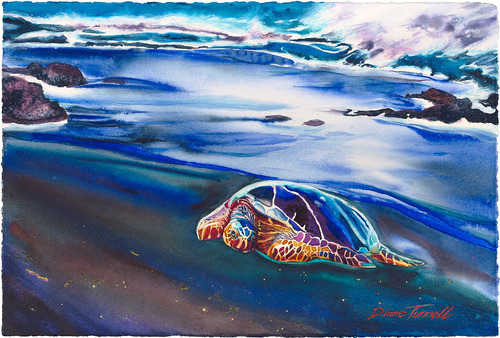 You’ll find this jewel of a painting, a contemporary green sea turtle at the Harbor Gallery, with a solid koa frame. There are many definitions of the Hawaiian word but one is guardian spirit or family protector. The owners assure me it won’t last long in their gallery. This orange double hibiscus beauty was also in my garden, and I couldn’t resist using high intensity complimentary colors. It is at Harbor Gallery, with a very elegant gold frame, deckled and floated on a red hued mat. 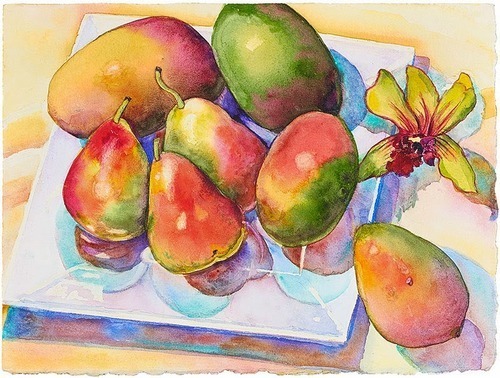 A small but delicious framed still life with mangoes, pears and orchid, I hope you’ll enjoy. This painting is at Harbor Gallery. I am pleased to have my latest watercolor painting chosen for the EHCC exhibition, by the distinguished juror, Momi Cazimero. She served as curator and juror for the State Foundation of Culture and the Arts, Honolulu Academy of Arts and other institutions in Hawaii. She received the “Living Treasure Award” in 2005. I enjoyed her informative juror’s talk about the selection process, looking at the meaning of the piece, good design, originality, technical excellence, presentation, relevance to our culture and time in history, etc. Since her standards are very high, I felt it was a great honor to have my ‘Io selected for the show. The HSFCA (Hawaii State Foundation for Culture and Arts also makes selections from the Fall Arts Festival so I felt good about having my piece exhibited there. Everyone who knows me well, knows about my love and respect for the native Hawaiian Hawk, the “Io. I have written about the hawk, and have seen many wondrous and memorable sitings of the 'Io near my house, around Kona and Holualoa. It was a joy to work on this painting, it felt very inspired. The eyes are more human, than animal, and hence the title evolved. We also have many lehua blossoms from the 'ohi'a trees around my home. It is said if you pick a lehua blossom it will start raining, and sure enough while observing one, it would start raining. I believe this is one of my best watercolor paintings yet, the colors are pleasing and more muted. Many more grays were used to enhance the warm red colors of the native blossoms. 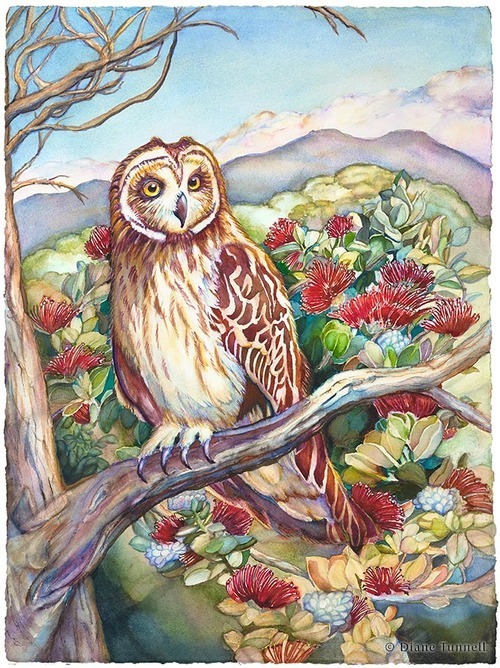 I am also ready to begin a watercolor painting of the Pueo, the native Hawaiian Owl, which I have also seen in Holualoa. They are drawn as a diptych at the artist Kathy Long’s suggestion. Welcome back to my blog! The juror Robert O'brien has selected two of my paintings for the show in Honolulu and they are now on exhibition! A friend recommended that I look at, photograph, and paint these lovely azaleas. They were amazing because of the white azalea and magenta flowers blooming on the same bush! Sometimes the unexpected is created so stunningly in Nature. Seeing a red and white rose on one bush also has many spiritual references, as I had been reading about and my friend happened to mention. Then after I painted the azaleas that were selected another friend pointed out red and pink miniature roses on a bush! I had a huge challenge with the blue background, but I love how it turned out and accentuates the delicate white azalea. 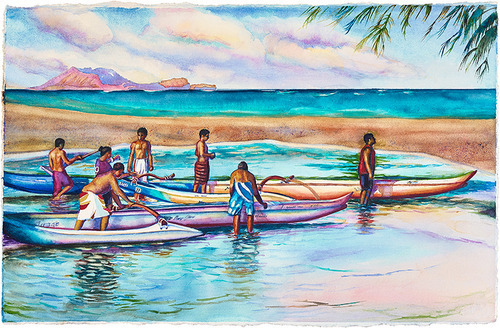 Recently I had decided to take on another challenge, that of depicting figures in Hawaiian scenes in my work. 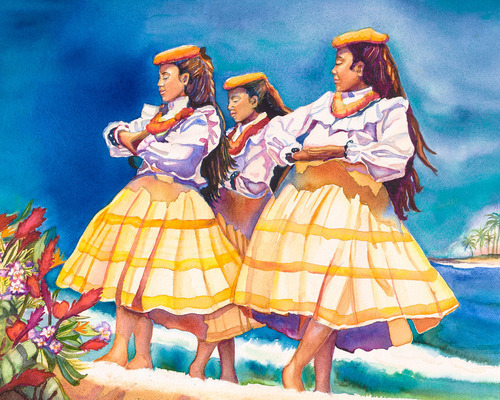 I saw these hula dancers in the King Kamehameha Day parade on Al'ii Drive in Kona, Hawaii and decided they were perfect to paint. Their grace, rhythm, youthfulness comes alive in the painting. Movement was created with the skirts and hair blowing in the breeze and the waves in the background. The dramatic blue sky contrasts with the yellow and white attire. I am also gearing up for another juried exhibition in Hilo, at the East Hawaii Cultural Center, this fall. 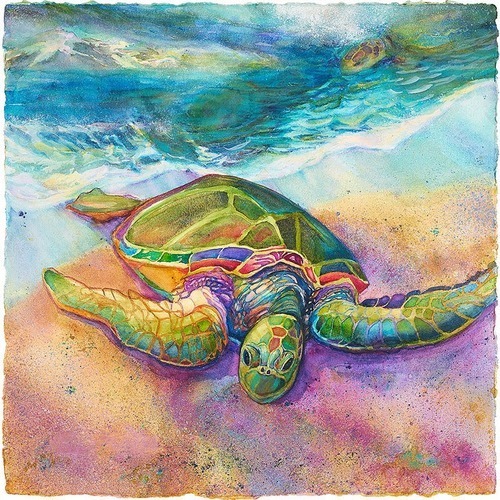 I plan to take paintings of a beautiful ocean scene, a pau rider and an I'o, the Hawaiian hawk. More on that later! Many friends and people attended the warm reception night last year, making it lots of fun. Mahalo to Mark Hanna, the owner, for inviting me back this year. Please join us. 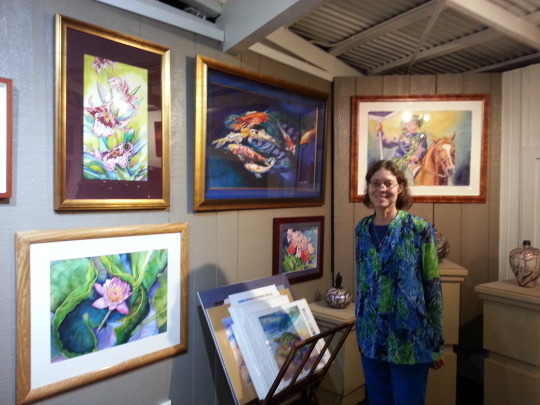 This photo showcases my paintings from last year’s show at the gallery. 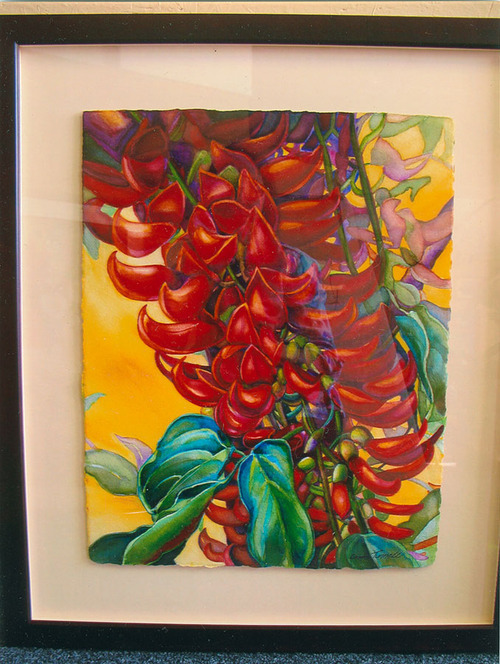 This painting “Glowing Red Jade” is in the Spring Hawaii Watercolor Society Show, the juror is Don Andrews. It is showing at the Arts at Marks in Honolulu, April 5 - 28th. Because of the rich red glazes, and flowing nature, it is one of my favorite paintings, and I love the deep, dark frame which enhances it all the more. The proud owner of the original “Darwin” came to my studio and then invited me to visit her lovely Asian influenced home in Kona, where “Darwin” now lives. It was wonderful to meet someone so completely enamored with the painting. 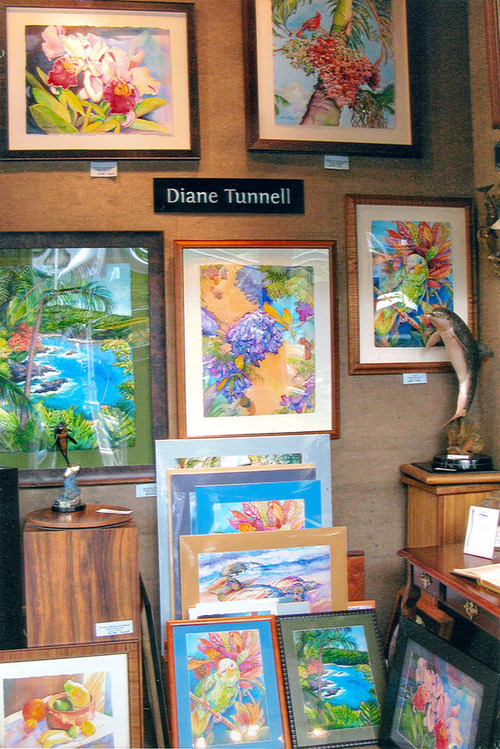 Three of my paintings are in downtown Honolulu at the 2011 HWS (Hawaii Watercolor Society) Open Exhibition, in the Pauahi Tower, 1001 Bishop Street, from October 15th through November 12th. They are Grandeur, Kamakahonu Bay, Child’s Play at Kua Bay and Honokohau Harbor. 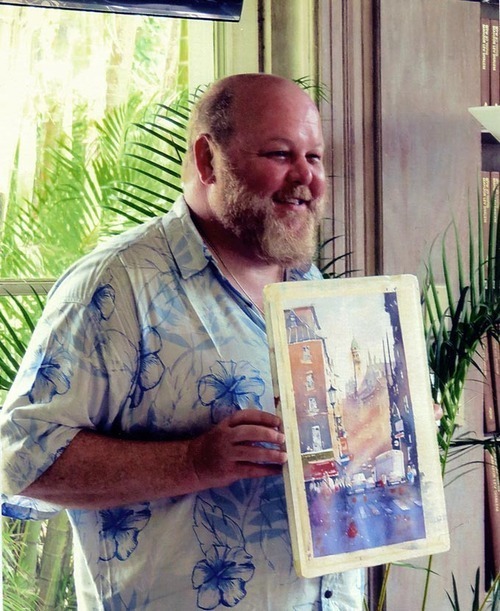 I wish to thank Ken Hosmer and his wife Linda, for such a wonderful time, when they came to Honolulu, and he taught a workshop and juried the HWS (Honolulu Watercolor Society) Show. Ken teaches so many important concepts about making paintings dynamic. We got to tour Honolulu with artist Rebecca Snow, who was a wonderful host and friend. 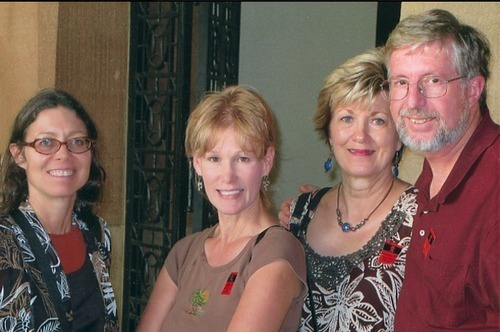 That’s me on the left, Rebecca Snow in the middle, and Linda and Ken Hosmer on the right. Three pieces of artwork grace the newly renovated dining room of the King Kamehameha Kona Beach Hotel. They are Grandeur, Kamakahonu Bay, Kukio Bay Sea Turtles and Majesty at Dusk. My thanks to artist and friend, Janet Lipps who designed the new dining room interior. 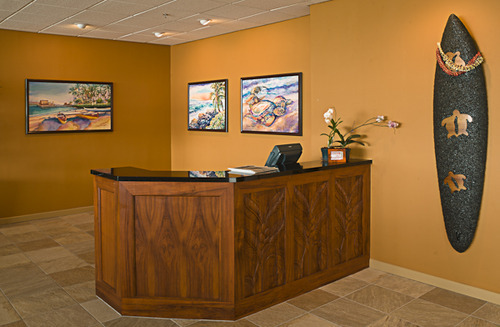 This is the reception area of the Honu Restaurant, in the King Kamehameha Kona Beach Hotel. My three paintings are on the left, and one of Janet and Chuck Lipps beautiful koa and stone surfboards is on the right. This is Kathleen Alexander on the left, and Carol Carter on the right. 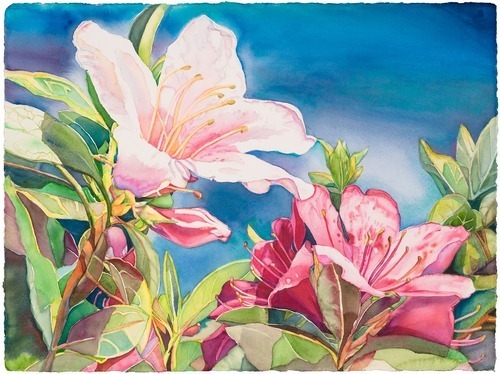 Here’s Kathleen again, with one of her beautiful watercolors, “Haiku Plumeria”. Also I sold one of my favorite original paintings, the Cardinal and the Christmas Palm. Yeah!